When it comes to makeup, the most important step for me is my base. I’d rather spend more time on my face and have a flawless looking than loads of times on my eye makeup and then my skin looking rubbish. So to achieve that flawless looking skin that many on us women like it is needed not only a good skin care routine and a good foundation but also a fantastic tool to apply your base. 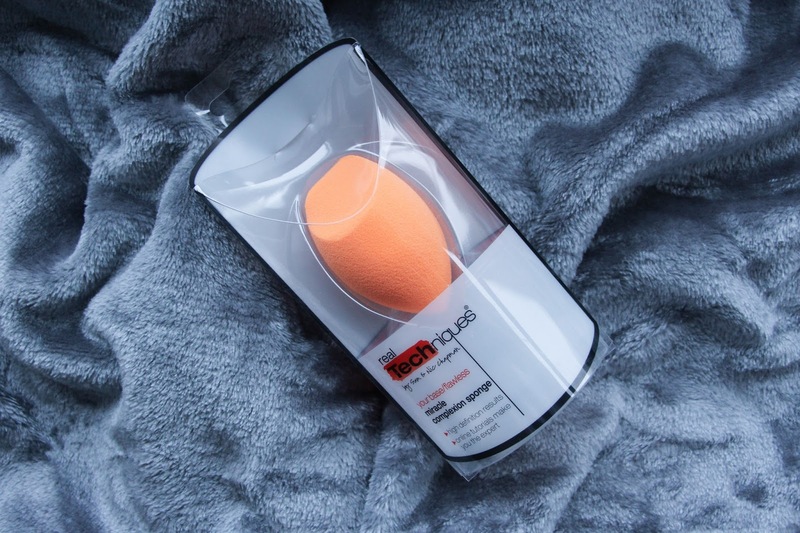 We have all heard about the beauty blenders or, in this case, the Real Techniques Miracle Complexion Sponge but as we all know many of you dislike and other loads of us like it so much that can’t live without it and I am one of them. I started using this tool maybe six months ago or so and since then, using a brush to apply my foundation just doesn’t feel right. Now I am here to tell you why you should stick up to the Real Techniques Miracle Complexion Sponge. Knowing how to use this tool is an essential or else you won’t get good results. So before starting to point out good reasons to love it, it is mandatory for you to know that for you to get the best results you should use this sponge damp. So it will double in size (maybe more) and you have to make sure you squeeze all of the excess water before use. Now that we are all good and we know how to use it properly, let me go ahead and tell you why you should give this product a go! 1. Say goodbye to “cakey face”. We all have dotted too much foundation on our face and ended up looking really cakey. When you use the sponge damp, it will absorb the excess product that you have put on your face only applying what the right amount. So after you can add up more coverage wherever is needed. This is the main reason why I love the Miracle Complexion Sponge! 2. More coverage, please! One thing that I have also noticed, specially when applying my concealer, is that while applying it with the beauty blender I get much more coverage because I am dabbing the product in the areas that I need the most and even if I do apply a tinny amount I get much more coverage than when I apply it with a brush. In my opinion the brushes just drag the product not giving me the coverage that I need. Even if you dab the product while using a brush you will never,ever get the same finish and coverage as when you apply with the Real Techniques Miracle Complexion Sponge. 3. Airbrushed effect. While makeup brushes might give you those horrible lines due to the bristles – specially when you don’t it in the correct motion -, with the beauty blender you dab, dab, dab and it is done. You don’t have to think too much while applying your makeup so there is no way of messing up your foundation. Just gently dab the foundation and you will look airbrushed in a matter of minutes. 4. Affordable. You can get the Real Techniques Miracle Complexion Sponge for £5.99 at Boots and for £3.99 on Amazon! What a bargain. And apart from that is lasts you a good five months if you take really good care of it. I know a brush will last years but… believe me this tool is totally worth it! 5. Easy to blend. Not only it helps you to avoid excess product, gives you more coverage and leaves you with a beautiful airbrushed effect, it also makes it easier to blend your foundation and concealer. I only use this tool to apply cream products and blending them has never been so easy. Trust me. So here you have five good – or maybe great – reasons on why you should buy and stick to the Real Techniques Miracle Complexion Sponge. To sum up, the tool itself is soft, gentle and to add up it is affordable, makes blending cream products a lot easier and also it is great on evenly applying the product and giving you more coverage and an airbrushed effect.